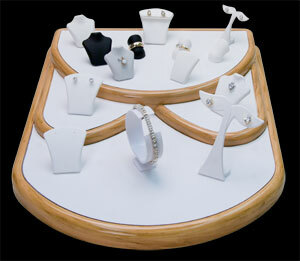 Ovadia Corporation is proud to add new magnetic elements to our innovative line of jewelry displays. Starting now, any of our existing displays with a flat surface can be modified to incorporate these magnetic elements. These new elements are versatile & capable of holding any type of jewelry. Ovadia’s magnetic jewelry displays provide a crisp clean presentation by utilizing our Oro-Lite material to provide an elegant backdrop to any jewelry type. our magnetic elements are custom designed to display rings, earrings, pendants (with or without a chain), bracelets and watches of almost any shape or size. The magnetic element can be placed on a metallic base covered in Leatherette or Micro-Suede for fully customized look and held securely in place with genuine neodymium magnets. Magnetic elements can be easily rearranged or removed from the display surface leaving no trace of it’s previous placement. This feature is extremely useful for removing empty elements from which the jewelry has been sold. By utilizing the power of magnets to enhance your jewelry presentation your business will have a superior edge over your competition. To learn more about this revolutionary new product contact Ovadia Corporation today!